Walls have many forms. The writer hits a wall. The race car hits a wall. The newcomers encounter a wall of prejudice. A wall might develop between friends. Then there are times when a wall can be a good thing. I like toilets surrounded by walls. And it is disconcerting to find a hole in the wall of a hotel room. Then there is the wall as a fence and guard post like the Great Wall of China. Walls…impenetrable, crumbling, ominous. For some, it is the best alternative to no agreement. Don’t even talk to me. 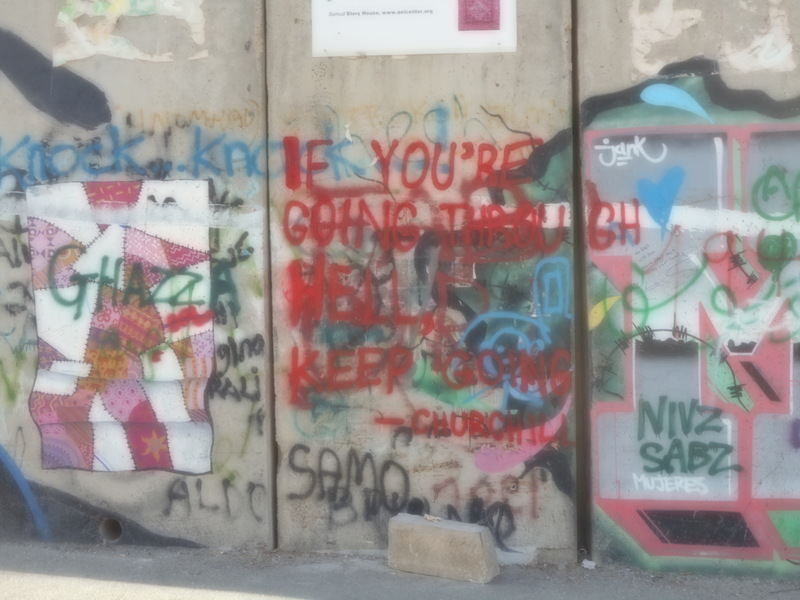 And a wall is a tangible reminder of conflict. 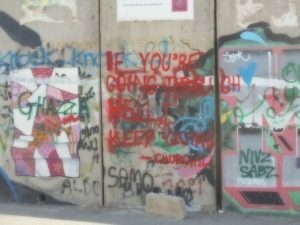 We are not united, and stay on your own side of the wall. Today, there is much talk of building a wall along the USA’s border with Mexico. 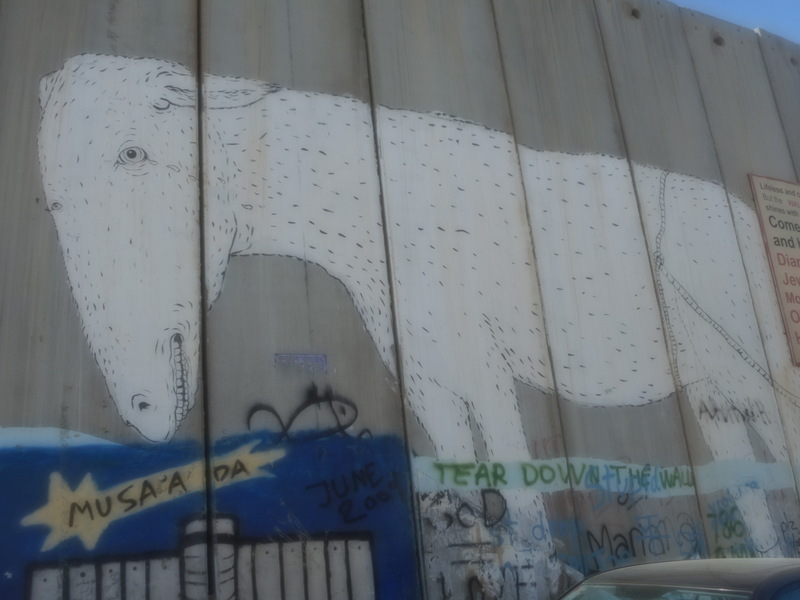 To me, the fate of the Berlin Wall speaks volumes about such an idea. I remember, years after the fall of the Berlin Wall, being at a circus performance in Berlin where the gymnasts ran up a tall wall over and over again in an unstoppable effort to overcome the wall; the emotion in the audience sent shivers up and down my spine. Border walls cost beyond construction costs. 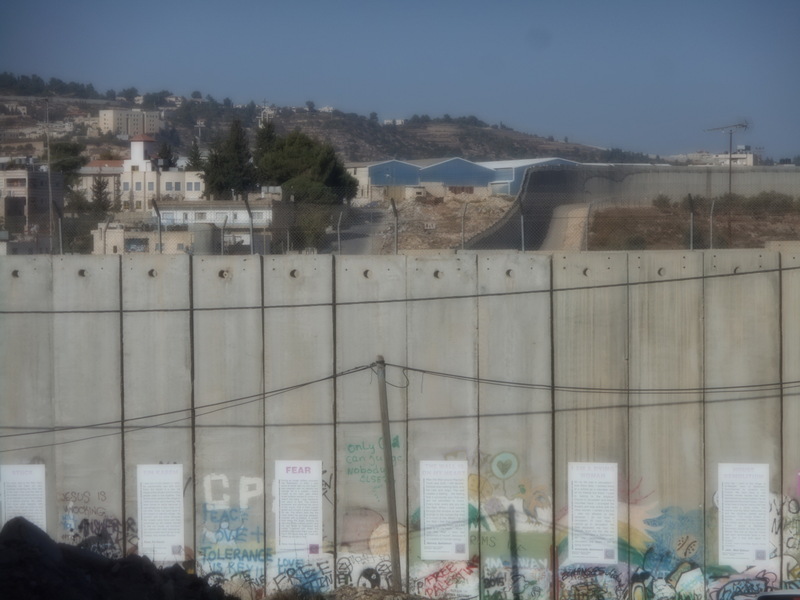 I was in Bethlehem (Bet Lehem) after the State of Israel erected a wall along the West Bank. From the town, it ruined the long range view and lent an air of imprisonment. Some artwork helped the aesthetics. But overall, the wall made me sad. When I got home, I dug out my Judy Collins CDs to listen to her sing “Tear Down the Walls” (a song by Fred Neil). While eminently sensible, it is often easier said than done. 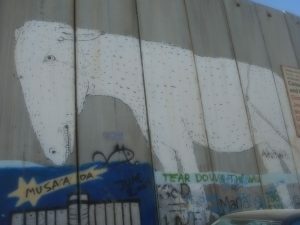 These are three photos of the wall at Bethlehem. TATTOO—Journeys on My Mind is available. GET this paper book or ebook at Amazon.com and BarnesandNoble.com and Apple’s iBookstore. But to buy on Amazon outside the USA, click HERE. CLICK on these links to purchase the audio book at Amazon, Audible or iBooks. Get an ebook or audio book or paper book now.